As these tea marbles are a hand-crafted item the size and weight of each one is similar but not uniform. Our Yunnan Black Marbles are approximately 2-3 gram each, so they are easy to use. Because these are so easy to re-steep, we recommend using a generous hand regarding the ratio of leaf to water. For each 6 oz of water we put 1-2 marbles in the cup or pot. When steeping many cups at once in a large teapot, we do not scale up the quantity of marbles, we use 5-6 marbles for a standard one quart teapot. 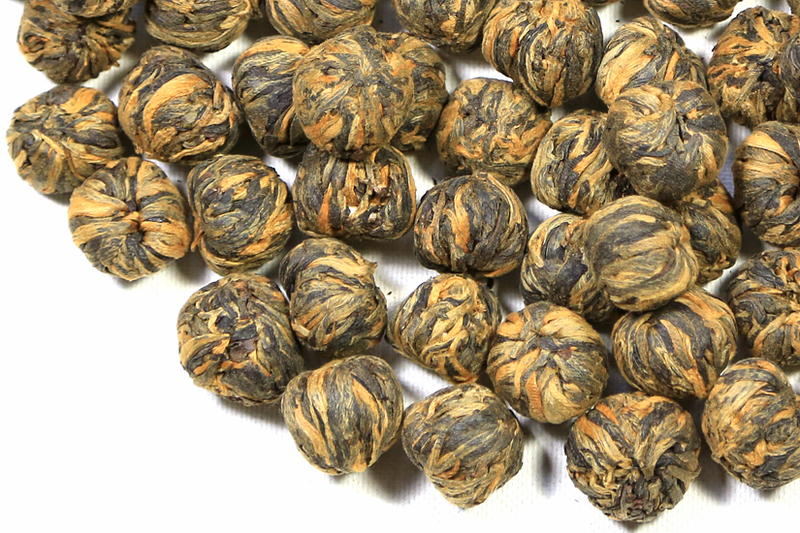 Because these are tied into their bundles with silk thread, they take a moment to open up, therefore the first steeping will likely be the lightest one flavor wise. Be sure to re-steep these delicious marbles, as additional water can be added and the same leaf re-steeped 3 or 4 times before the flavor is all extracted. You can adjust the steeping time from 2 minutes per, up to 5-6 minutes per steeping. You will note changes in the flavor profile of these steepings, ranging from malty to chocolate, spicy to smooth caramel. This leaf is rich in amino acids, so the steeped liquid will cloud heavily when cool. Remember that the total quantity of liquid yield will be high, so 5-6 marbles, steeped three or four times in one quart of water (each steeping) will produce as much as one gallon of steeped tea over the course of several steepings. Customers who try these for the first time are usually speechless, because these are truly delicious! We receive positive feedback on them from a far greater number of tea enthusiasts than many other teas. They are shockingly fun, reliable and delicious. Do you remember this lovely tea from many years ago? The family that makes ours for us threatens to stop making them regularly, because they are so labor-intensive to fabricate, but recently we have been able to continue to obtain more of these delicious, hand-made, black tea leaf bundles from them. As this batch was made in mid-autumn 2018, the flavors will come together and deepen over time. The marbles are excellent to drink now but will be so much better from April 2019 & on for a few years! 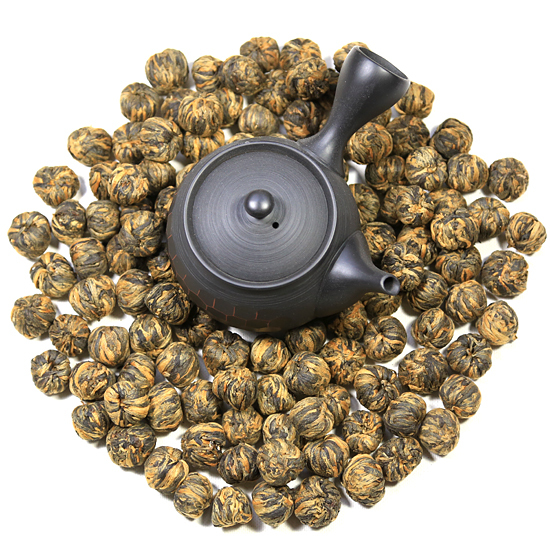 Our Yunnan Black Marbles are quite an unusual black tea. Unlike loose leaf black tea, these uniformly-sized, hand-rolled & tied marbles require multiple infusions to release all the flavor that these bundled leaves have to give. We re-steep almost all Yunnan Black teas, but with these it is essential! 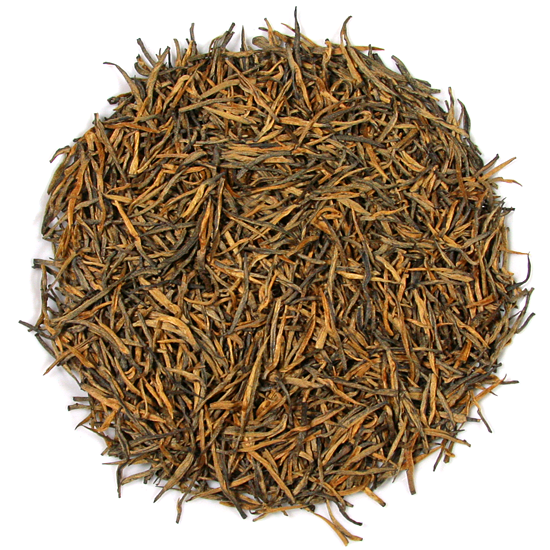 Fengqing County in Yunnan Province China is a famous black tea processing area in southwestern China. Unique sub-varietal tea bushes found in remote tea growing areas produce the perfect size and textured fresh leaf to hand-form and carefully-craft these delicious dian hong ‘marbles’. 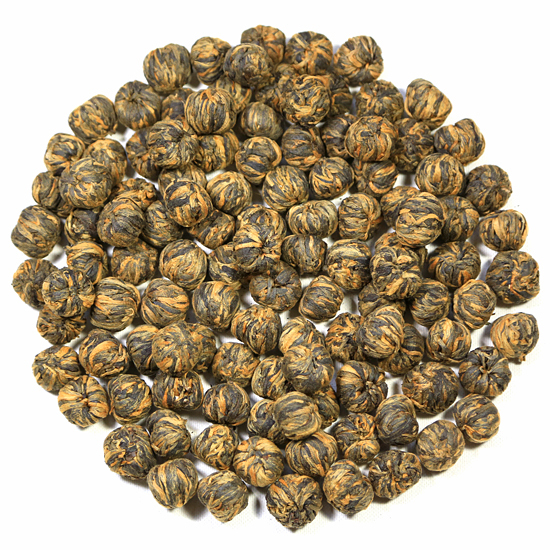 Our black tea marbles are made with very tippy leaf and pliable buds. Being from a spring pluck, the marbles that we have right now are quite aromatic, and the taste has a striking, rich flavor. This taste, with its hints of dulce de leche creaminess, is followed by a tiny bit of malty sweetness and cocoa in the after-taste (‘returning flavor’). Yunnan teas made from mature tea bushes offer the luxury of time as they will generally store well and maintain their complexity for several years. These teas mellow with age and will be best after 12 months to 24 months – heck, we’ve even tasted Yunnan black teas that were ‘just getting good’ 2 years after harvest. The key is proper storage (cool and reasonably airtight: a ceramic jar is ideal), which will serve to underscore the inherent concentration of flavor elements that premium Yunnan leaf has in abundance. These tea marbles will store extremely well, because the exposed surface area has been reduced to a minimum in the shaping process.